CROSSFIRE ‘London’s big night out’ this Easter! Now in our 16th year of this super successful London club night that started back in 2001 bringing together all the different elements of the London 60s scene for a big night of pure vintage underground partying. This 1000 capacity venue in the heart of Central London home to Le Beat Bespoké, Nutty New Year and New Untouchables live promotions has three rooms of action with an all night bar! Our fabulous Ballroom with huge wooden dance floor is perfect for a night of quality NORTHERN SOUL OLDIES. Hosted by Kent Records and 6Ts promoter and DJ Ady Croasdell + guests Dave Evison, John Vincent, Roger Stewart and Chris Dale. 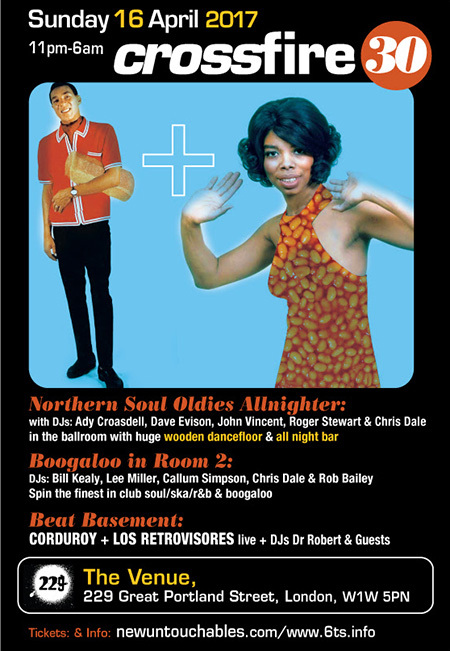 The R&B ROOM is hosted by the New Untouchables with authentic Rhythm and Blues, Ska/Reggae and Club Soul on the menu. The BEAT BASEMENT is hosted by Mousetrap ‘Fuzz 4 Freaks’ all-nighters with guest appearances from the fabulous Corduroy and Los Retrovisores.